I’m sitting out a Sew Weekly challenge. There, I said it. I’m feeling totally guilty but after last week’s romper fiasco, I remembered that one of my goals for 2012 is to make things that are wearable. While I definitely have some items that could have been used for the refashion challenge (including that romper), I wanted to make sure that I’m getting some other projects completed that I’ve had on my list, and I wasn't ready to work on my refashion just yet. With that said, one of the projects that I did want to get done for this week was the Pastille dress for the Sew Colette sewalong. I’ve had this floral print fabric in my stash for over a year. I wish I kept my purchase details, but I don’t think it was too expensive, and I always shop with a coupon. When I saw the Pastille pattern, I knew that’s what the fabric would be used for. Fabric: Cotton print. I think I got it from JoAnn’s over a year ago but I honestly can’t remember the price. I’m going to say it was approximately $15 for a little over 3 yards. Wear again: Yes! I love it! The pattern was really easy to put together. 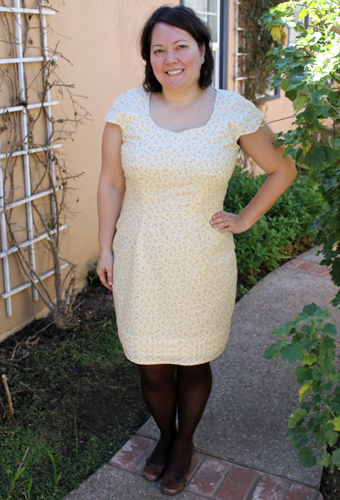 The dress shape reminds me of the top for Colette’s Crepe dress, but in a non-wrap from. Which is awesome because I rarely have 5 yards of fabric to spare. The biggest challenge was the bottom pleats. I broke up the ‘tracing’ stitching by doing the front dress panel first. After I attached the sides, I made sure that the back panels lined up, and then stitched in the tracing seams. I think this helped to ensure that the pleats were even when it came time for pressing. The pleats were the most time consuming part of the process. Just lining everything up, tracing the proper lines to the patterns, sewing in the tracing stitches, assembling, stitching, pressing... whew! 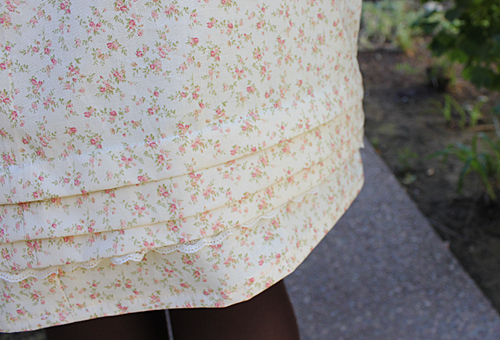 I added a little extra feature to the dress by adding lace under the final pleat. It just peaks through, but I love the look. It just makes it a little more girly. Because of the final pleat design, I took a couple of inches off of the final hem. I love how the dress came out! I’d been looking forward to doing it, but got lazy whenever I thought about doing the pleats. Now that it’s done, I’m totally happy with it and glad I had the sewalong to encourage me to finish it. It's odd sitting out a Sew Weekly challenge, isn't it? I did the same thing a few weeks ago and still feel slightly guilty for some reason....! Really like the pleats on the bottom. 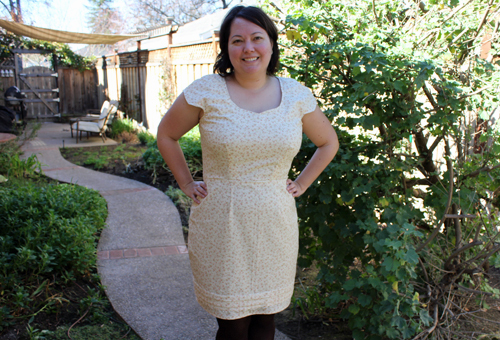 A very figure flattering dress. I love it!!! I had wrote this pattern off thinking it would not look nice on my figure but now I just have to give it a shot. I love Dear Frankie - oh Gerard Butler *swoon* Your Pastille dress is just lovely! I love the print on your fabric and your added little lace detail - it looks great on you! I really love that dress. The fabric is beautiful. You got a great fit on this dress, and I really like your bit of lace on the trim. Great job! I agree the fit is fantastic ! You look GREAT in this dress. I have the book and this dress was my least favourite... Well not anymore !